I have spent a fair amount of time recently working with Lync 2010 testing out new features and trying to figure out how everything works! One of the exciting developments in Lync is how well integrated it is with the rest of the Microsoft product stack. For me however this has caused some serious challenges as my knowledge of SharePoint is minimal, and certainly limited to end user knowledge. 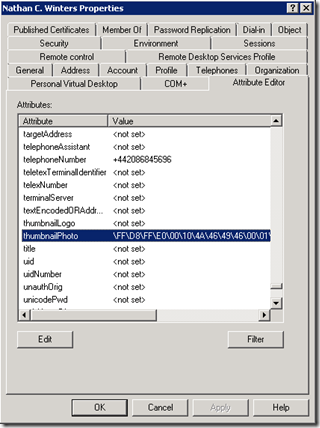 This post outlines the process needed to get Lync showing photos uploaded to a users “My Site” in SharePoint 2010. 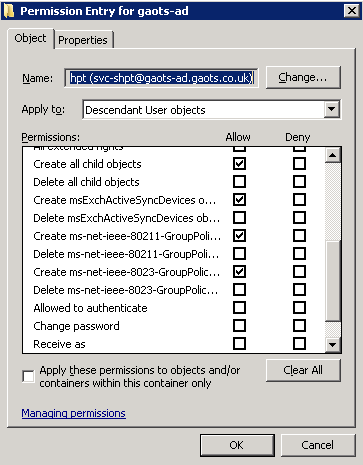 I am making the assumption that you already have SharePoint installed and that it has functioning “My Sites”. This was done for me by a colleague SharePoint consultant! What follows is a discussion of the steps taken to get integration with AD to work and some of the troubleshooting tools I found along the way. Step 1 from the above is easy to follow. 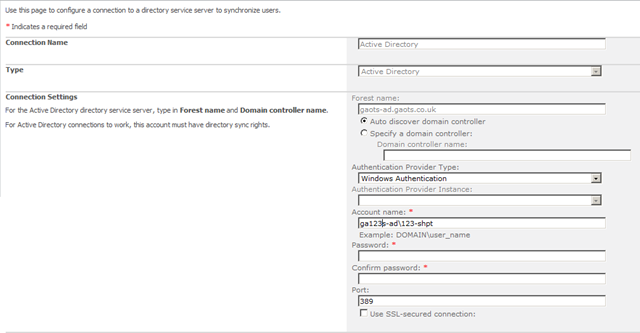 Step 2, makes the assumption that the User Profile Synchronization service is already in place. For me this was the case, however there was an issue with accounts which I will come onto! The reason I show that is because it shows the Source Data Connection. Given that I didn’t set this up, I thought I would investigate further, and it’s a good job I did because it became important to know what user account was being used for synchronization. Back on the Central Administration, Manage Profile Service page seen below, I clicked on the Configure Synchronization Connections link. 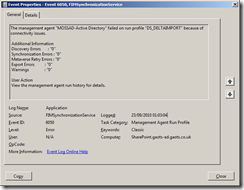 You can see the Active Directory connection shown on the Picture Export screenshot above. Drilling into the connection shows that it runs using the 123-shpt service account. I kicked off a full synchronization but it didn’t look like much was happening and photos certainly weren’t appearing in AD. At this point I looked at the event logs on the SharePoint server. The following two blog posts both helped troubleshoot this. C:\Program Files\Microsoft Office Servers\14.0\Synchronization Service\UIShell\miisclient.exe. This application is your window on FIM and shows exactly what is happening during the synchronization. I discovered that my problems were permission related. 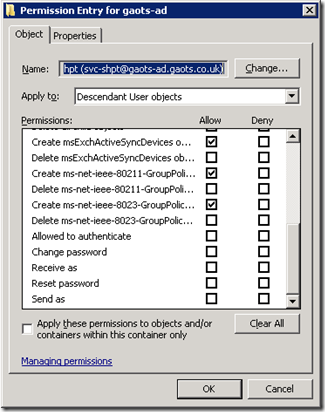 What was needed was to ensure that the account mentioned above (in the SharePoint Directory Connection section (123-shpt) has the relevant rights in AD. This is confusing because a number of posts say that it the account which runs the FIM service which needs rights, but this doesn’t appear to be the case. Right-click the domain object, such as “company.com”, and then click Properties. 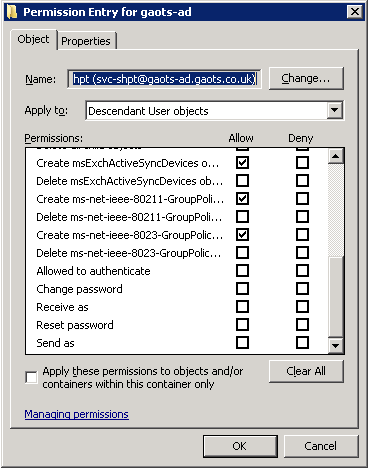 Having done this the I kicked off another Full Synchronization in SharePoint and whilst viewing though the FIM SSM mentioned above, saw that connections were taking place. However, there were still errors! Again they were permissions based, and this time it was specific to the end users who I was trying to provision a photo for. After a fair bit of digging it turns out that the 123-shpt account also needs rights to all users in the domain to provision permissions. 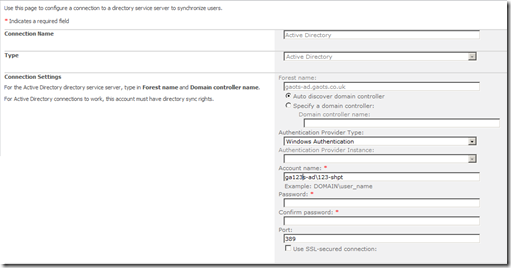 I provided this by setting permissions for the 123-shpt account on the root of the domain. 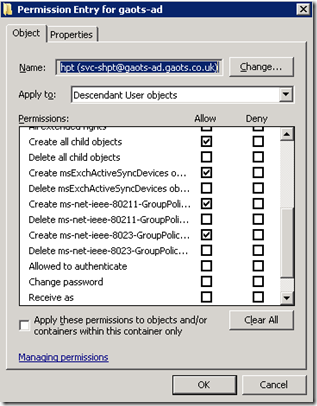 I used the advanced settings to ensure that the permissions only applied to Descendant User Objects. At a high level the permissions needed are Read, Write and Create all child objects however when broken out they look more complex as seen below. Having made those changes, I kicked off a final Full Synchronization and found that photos were imported demonstrated by viewing the Attribute editor of the user object. 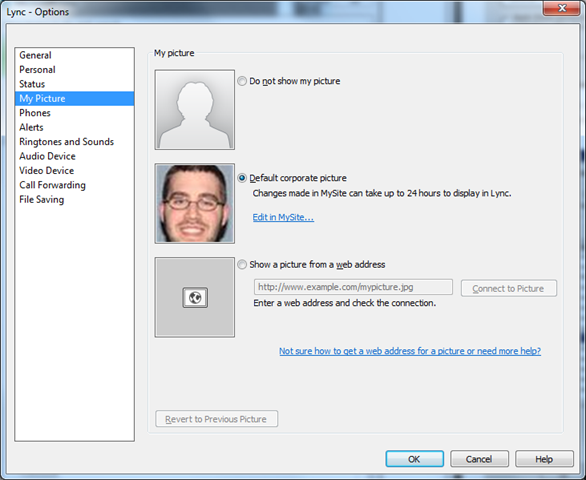 Signing out and back in on Lync made the photo show up. First off thank you for this great information. Event ID 8311 “An Operation failed because the following certificate has validation errors:\n\nSubjectName: The root of the certificate chaine is not a trusted root authority”. Any insight into how we could continue troubleshooting this? You could always use the evaluation version of http://www.namescape.com rDirectory to populate the photos…..